The idea that a kid is responsible for things is not inborn—it doesn’t just happen by itself. It needs to be taught, coached, and learned. In some ways, it’s no mystery: kids are born with no responsibilities and everything they do is by instinct. They cry when they’re hungry or want something, and they go to the bathroom when they have to relieve themselves. There’s really no responsibility there, it’s all instinct and cause and effect. Understand that it takes a lot of discipline and maturity for a kid to stay on task when something isn’t fun. It takes practice. And it requires that you coach your child to be responsible and that you hold your child accountable for his responsibilities. Here are seven tips that will help you to teach responsibility to kids and guide them to be functional and independent adults. Do parents simply forget to teach responsibility? Every parent I’ve ever met, no matter what other qualities they had, knew enough to tell their kids to wash and get dressed, to go to school, or to clean their room. Parents don’t always promote accountability, and that’s where the flaw is. But it’s not about saying the words—it’s about how parents react when their child doesn’t wash or go to school or clean his room. In other words, parents don’t always promote accountability, and that’s where the flaw is. Accountability has to be enforced. You have to hold kids accountable for not meeting their responsibilities. Being held accountable requires that the parent make the consequence worse than if the child had completed the task in the first place. And that act of being held accountable promotes a willingness to meet the responsibilities next time. Many parents either don’t hold their kids accountable or don’t follow through on the consequences once they set them, which in turn just promotes more irresponsibility. Once again, the child learns that his excuses and lies and justifications work for him in his effort to avoid responsibility for himself or his behavior. He also learns that things don’t have to be earned and that society, as represented by his parents, won’t follow through and hold him accountable. It’s a bad lesson to learn. So it’s vital to teach kids how to be responsible and if they aren’t, you have to hold them accountable. As early as you can in your child’s life, start having them take responsibility for the things with which they’re involved. For instance, have your child pick up his toys before he goes to bed. Now, if he has a hard time concentrating on that because he’s young, get down on the floor and pick them up with him. But don’t do it for him. Even if it’s “I’ll do one then you do one,” he learns to take care of his responsibilities. I also think you should give kids alarm clocks early in life. This helps them learn the responsibility of setting the clock at night and then getting up and shutting it off. What you’re doing is teaching them from a young age that they’re an individual and that they have their own individual responsibilities. In other words, the more you identify it, the more conscious your child becomes of it. I think it’s important for them to understand they’re getting rewarded for completing their responsibility, not for being cute, lovable, or chummy. The earlier you connect the reward to the responsibility, the more clearly that becomes associated in your child’s mind. The idea is that you’re modeling the right behavior. Be the example. As a parent, when you tell your child you’re going to do something, it becomes your responsibility to do it. So, don’t make promises you can’t keep and, when meeting responsibilities, be sure to use language that says so. I think it’s important to sit down and explain to children what responsibility means. Responsibilities are like commitments or promises—they’re the things you have to do, the things that are your job, and the things you’re involved in where other people are depending on you. Coach your child into meeting their responsibilities. I think it’s very important that kids be coached and not just lectured to. A coach doesn’t go out onto the court and shoot the basketball for you. Instead, coaches work from the sidelines. And they coach instead of criticize. In the same way, I think it’s important to coach kids about their responsibilities. 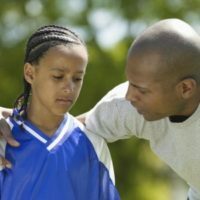 Criticism has a place in life, but in this situation with kids, it only makes them defensive when you start to scold them about something that didn’t get done right. It’s sometimes helpful for parents to sit with their kids and draw up a list of consequences. How can you hold kids accountable? What do you have that can be an effective consequence? You can withhold things like electronics or assign extra chores or extra work. You can give them task-oriented consequences. At the same time, come up with a list of rewards. I call this a “rewards menu.” This shouldn’t only involve spending money or buying things. Does your child like to take walks, go to the park, or maybe the beach? Do they like to play catch? Do they like to swing? And that’s the reward. Rewards don’t have to be expensive—you just have to use your imagination. For older kids, you can go hiking, go downtown, go by the river, go to the park, more screen time. For teens, you can let them earn later bedtimes or more time with their friends. With adolescents, the reward is often getting away from you and being on their own, and that’s okay. Discuss why meeting responsibilities are important to your success in life. People who don’t meet their responsibilities are not successful. Learning how to meet responsibilities is one of the most important skills kids can learn when they’re young. As they grow older, they’ll have a thorough understanding of the relationship between responsibilities, accountability, and rewards. But, it’s never too late to learn. Kids who don’t learn to meet responsibilities at an early age need to learn them at whatever age the parents get ready to teach them. When kids develop personal responsibility, it gives them their best chance of avoiding many of the pitfalls of life. It makes them better able to deal with inevitable problems that arise in life, particularly as they get older. There are those who say you should expect your child to act responsibly. But I say you should require it, even demand it. Teach and coach it. Be thoughtful about how to enforce accountability. It’s a part of maturing, and it is a very necessary component to learning how to function in an increasingly complex and demanding world.